MEF completed a draft technical specification that defines an SD-WAN service and its various attributes. The draft spec is circulating among MEF members. A complete MEF 3.0 SD-WAN Service Attributes and Service Definition standard is expected in 1Q 2019. SD-WAN service standardization will enable a wide range of ecosystem stakeholders to use the same terminology when buying, selling, assessing, deploying, and delivering SD-WAN services. The SD-WAN service definition is a foundational step for accelerating sales, market adoption, and certification of MEF 3.0 SD-WAN services orchestrated across a global ecosystem of automated networks. 1. The industry's first SD-WAN service definitions, which provide common terminology for buying, selling and delivering standardized SD-WAN services. Look for these in Q1 2019. 2. LSO Sonata API - providing the ability to automate MEF services end-to-end globally. A developer release is now available. A number of service providers, including CBCcom, PCCW Global, Sparkle and Tata Communications, together with technology vendors Clear Blockchain Technologies and Cataworx, are building a Proof of Concept (PoC) to show how telcos can introduce next-generation services thanks to innovations in blockchain technology, artificial intelligence and intent-based customer interfaces. The commercial solution, provided by Clear, involves automated multiparty inter-carrier blockchain-based invoicing, payments, dispute resolution, SLA based remedies and settling. The process eliminates manual, labor-intensive and time-consuming elements of settlement, invoicing and clearing, accelerates quoting and invoicing and enables synchronized inter-carrier usage-based billing. With the elimination of a centralized orchestrator, neighboring carriers can transact directly, flexibly and automatically without revealing any sensitive commercial or operational information to a third party. This creates an equal-level bandwidth-on-demand play-field enabling any carrier to participate in the next wave of service innovation, based on their footprint and carrier-relations assets, free of vendor lock-in. The PoC will be demonstrated between the 29th and 31st of October 2018 at the MEF18 global networking event (MEF18event.com) in Los Angeles, California. MEF 3.0 is the spec that defines how carriers will talk to each other in the age of software-defined services. 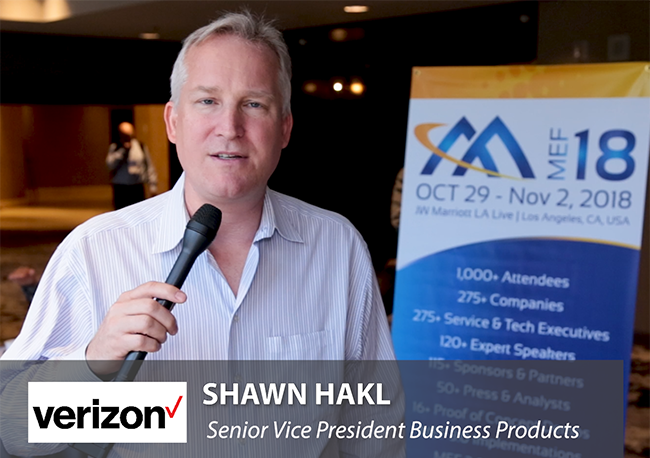 In this video, Shawn Hakl, Senior Vice President Business Products, Verizon, provides a general overview of MEF 3.0 and then gives a technical update on the latest development as of mid-2018. Filmed at the MEF Annual Members Meeting in Nashville. 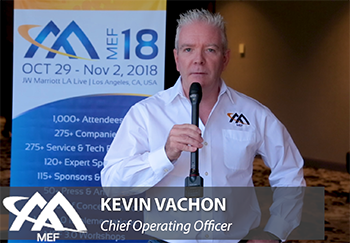 MEF announced its 2018-2019 Board of Directors, representing a broad geographic distribution of major service providers. This week's MEF Annual Members' Meeting in Nashville was highly productive, featuring advancements in all of the following areas: Layer 1 specifications; Layer 3 specifications; SD-WAN; Carrier Ethernet work; LSO inter-carrier APIs; first MEF 3.0 certified companies; professional certification program; planning work for the MEF18 event and Proof-of-Concepts (PoC) showcase this autumn. 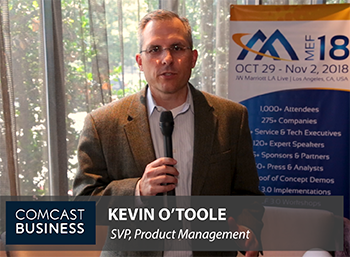 The market has really begun to embrace SD-WAN, says Kevin O'Toole, Senior Vice President, Product Management, Comcast Business, in order to cut their costs and unlock the power of new last-mile access networks. MEF is working on standards to support the evolution of SD-WAN. In terms of network services, customers want simplicity and agility to transform their own businesses. MEF 3.0 presents a massive opportunity to standardize the automation of services, says Aamir Hussain, EVP and CTO, CenturyLink. Filmed at the MEF Members' Annual Meeting in Nashville. MEF is extending its service definition work to Layer 1, which is often referred to as wavelength or optical services. Several client protocols are supported, including Ethernet, Fibre Channel, SONET/SDH. David Martin, Senior Systems Engineer, IP/Optical Networking, Nokia, discusses the advantages of this approach. 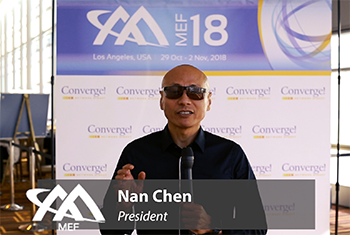 The recently concluded MEF-ONF-OIF interoperability demo that focused on the Software-Defined Networking (SDN) Transport Application Programming Interface (T-API). NEC's Karthik Sethuraman and Centurylink's Jack Pugaczewski provide an overview of the demo. A proof-of-concept (PoC) on this topic will be presented at #MEF18. Roman Pacewicz, Chief Product Officer at AT&T Business, has joined the MEF Board of Directors. Optical Internetworking Forum (OIF), in collaboration with MEF, successfully concluded its 2018 Software-Defined Networking (SDN) Transport Application Programming Interface (T-API) multi-vendor interoperability demonstration. 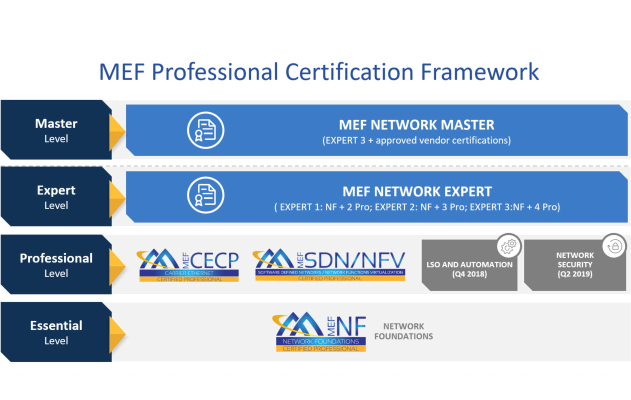 MEF announced the production release of its MEF SDN/NFV professional certification, which validates professionals’ knowledge, skills, and abilities in the domains of software-defined networking (SDN) and network functions virtualization (NFV). The MEF-SDN/NFV certification exam is built around the key themes of “Design, Deploy, Manage", and details and references are contained in the newly released examination blueprint. Professionals seeking to validate their competencies must be able to demonstrate their abilities in various design, installation, and security scenarios involving SDN, NFV, and instances when virtualized objects such as VNFs (virtualized network functions) are deployed into SDN architectures. MEF also announced that five training companies are qualified to deliver approved training for this certification. The five Accredited Training Providers (MEF-ATPs) are Carrier Ethernet Academy, Criterion Networks , Perpetual Solutions , SDN Essentials, and Tech2000. Incentives for IT/telecom professionals to earn this credential were also announced today by MEF. 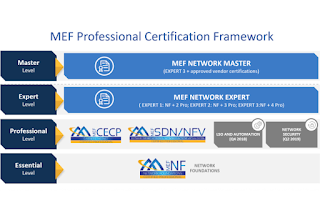 MEF now offers three certifications as part of its comprehensive Professional Certification Framework: MEF-SDN/NFV Certified Professional, MEF Carrier Ethernet Certified Professional (MEF-CECP), and MEF Network Foundations (MEF-NF) certifications. MEF reported progress on the standardization of orchestration-ready Ethernet, IP, SD-WAN, and Layer 1 services that form a core element of the MEF 3.0. 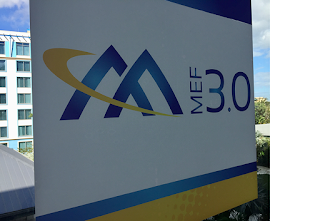 Specifically, MEF has published two new MEF 3.0 Ethernet and IP specifications, progressed two major MEF 3.0 SD-WAN projects, and moved closer to finalizing a MEF 3.0 Layer 1 service definition specification as soon as 3Q18. MEF has just published the Managed Access E-Line Service Implementation Agreement (MEF 62), which defines a new service with a specific set of management and Class of Service (CoS) capabilities designed to accelerate service provisioning and to simplify management of services that traverse multiple operators. The MEF 3.0 Managed Access E-Line (MAEL) service is derived from the MEF 3.0 Access E-Line service specified in MEF 51. MEF 62 reduces ordering and provisioning complexities when a service provider requires an Operator Virtual Connection (OVC) service from an operator by defining a MAEL service with a simplified set of CoS requirements – e.g., a single CoS name per OVC – coupled with a simplified set of management requirements for SOAM fault management, SOAM performance management, and latching loopback. By leveraging the management capabilities in the MAEL operator’s network, MEF 62 also intends to eliminate the need for a service provider to deploy hardware – e.g., a NID – at the subscriber’s location to monitor services. 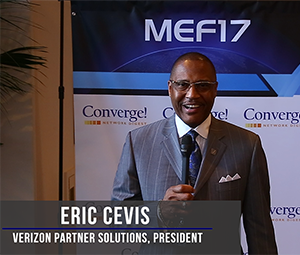 AT&T, Bell Canada, Canoga Perkins, Ciena, Cisco, HFR, and Zayo joined Verizon in contributing to MEF 62. MEF has published the Subscriber IP Service Attributes Technical Specification (MEF 61) as the first in a planned series of MEF 3.0 IP specifications aiming to address these challenges. MEF 61 specifies a standard set of service attributes for describing IP VPNs and Internet access services offered to end-users and will be used as a starting point for defining attributes for operator IP services. It introduces IP UNIs and IP UNI Access Links for describing how a subscriber is connected to a service provider as well as IP Virtual Connections and IP Virtual Connection End Points for describing an IP-VPN or Internet access service between those UNIs. Specific service attributes and corresponding behavioral requirements are defined for each of these entities. These include support for assured services – e.g. multiple classes of service, with performance objectives for each class agreed using a standardized set of performance metrics in a Service Level Specification. Bandwidth Profiles that can be applied to IP services are also described, allowing the bandwidth assigned to each class of service to be agreed in a standard way. Albis-Elcon, Ceragon, Ciena, Coriant, Cox, Ericsson, HFR, RAD, TELUS, TIM, Verizon, Zayo, and ZTE joined Cisco in contributing to MEF 61. 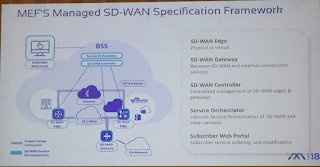 MEF 3.0 SD-WAN -- there are two major SD-WAN initiatives underway: the Multi-Vendor SD-WAN Implementation project and the SD-WAN Service Definition project. The first project is focused on addressing the rapidly growing problem of orchestrating services over multiple SD-WAN deployments that are based on different technology vendor products. MEF member companies – including SD-WAN vendors Riverbed, VeloCloud (now part of VMware), and Nuage Networks from Nokia and software development services provider Amartus – are collaborating to use MEF’s new, standardized LSO Presto Network Resource Provisioning (NRP) API to meet these interoperability challenges. 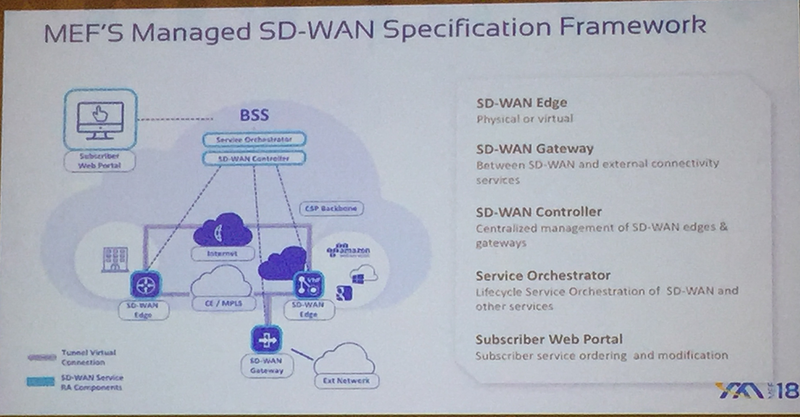 In the second project, MEF members are collaborating to develop an SD-WAN service specification that defines the service components, their attributes, and application-centric QoS, security, and business priority policy requirements to create SD-WAN services. This initiative is led by Riverbed and VeloCloud, now part of VMware, with major contributions from Fujitsu. MEF 3.0 Layer 1 -- MEF is in the final phase of the review and approval process for a new specification that defines the attributes of a subscriber Layer 1 service for Ethernet and Fibre Channel client protocols – used in LAN and SAN extension for data center interconnect – as well as SONET and SDH client protocols for legacy WAN services. Nokia, Bell Canada, Cisco, and HFR have contributed to this project. Work already is underway on a companion specification defining Operator Layer 1 services between a UNI and an OTN ENNI (access) and between two OTN ENNIs (transit). This will provide the basis for streamlining the interconnection of multi-domain Layer 1 services. Standardized, Orchestrated Services - including Carrier Ethernet, wavelength, IP, SD-WAN, Security-as-a-Service, and other virtualized services that will be orchestrated over programmable networks using LSO APIs. MEF 3.0 CE R1 is the first release within the MEF 3.0 framework, while work on standardizing orchestration-ready wavelength, IP, SD-WAN, and security services currently is progressing within MEF. Open LSO APIs - MEF’s LSO Reference Architecture guides the agile development of standardized LSO APIs that enable orchestration of MEF 3.0 services across multiple providers and over multiple network technology domains (e.g., Packet WAN, Optical Transport, SD-WAN, 5G, etc.). MEF recently announced the first releases of two LSO SDKs (software development kits) that feature inter-provider APIs for address validation, serviceability, and ordering and an intra-provider API for network resource provisioning. The LSO APIs included in these SDKs are available for experimental use by MEF members and associated MEF programs. Service and Technology Certifications. MEF is increasing the agility of its popular certification programs to accelerate availability and adoption of MEF 3.0 certified services and technologies. Iometrix continues as MEF’s testing partner, but the certification process is now being virtualized and taken into the cloud. A subscription model will be used for that vendors and carriers will be able to certify that their services and technologies comply with the latest MEF 3.0 standards. This should speed up the certification process considerably from days to minutes. Expanded Community Collaboration. MEF is working with service and technology providers, open source projects, standards associations, and enterprises to realize a shared vision of dynamic services orchestrated across automated networks. MEF has created a new compute, storage, and networking platform – MEFnet – that enables development, testing, integration, and showcasing of prototype MEF 3.0 implementations using open source and commercial products. 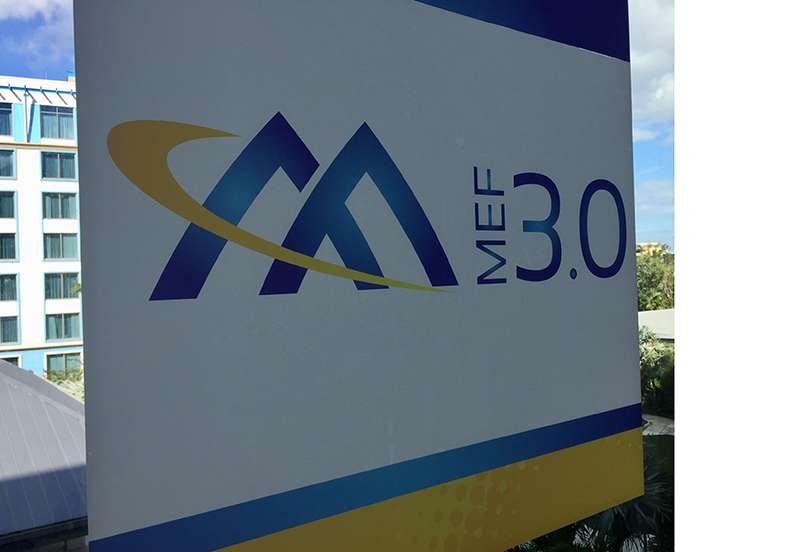 MEFnet projects will help accelerate the understanding and adoption of MEF 3.0, as well as provide immediate feedback for standards development within MEF. MEF published two new specifications advancing the orchestration of MEF 3.0 connectivity services over multiple network layers, including the optical domain. Both standards were developed within MEF’s LSO (Lifecycle Service Orchestration) Reference Architecture. Network Resource Management (NRM) – Information Model (MEF 59) -- defines the information model to facilitate the orchestration of Carrier Ethernet connectivity services through WAN SDN controllers, OTN subnetwork managers, and legacy network management systems. The MEF NRM model is specified in Papyrus UML and is based on current and developing best network management solutions by ITU-T, ONF, and TM Forum to allow for wider interoperability across multi-vendor and multi-technology platforms. This approach also facilitates upcoming work on OAM and OTN. Along with the LSO RA, the MEF NRM serves as a basis for the new MEF 60 specification and thus supports the LSO Presto interface. CenturyLink, Ciena, Cisco, Coriant, Ericsson, Huawei, Infinera, NEC, and RAD joined Nokia in contributing to MEF 59. Network Resource Provisioning – Interface Profile Specification (MEF 60) -- provides an abstracted, intent-based solution for activation of – as well as topology retrieval of – network resources in support of MEF-defined services. The specification is complemented by an enhanced LSO Presto SDK (software development kit) that has been made available to the MEF Developer Community on the MEF GitHub. "The CenturyLink-led MEF 60 provides an essential solution in the overall development of the MEF LSO portfolio of APIs,” said Jack Pugaczewski, editor of MEF 60 and Distinguished Architect, CenturyLink. “This development effort is a great example of a traditional standards development and open source hybrid, which resulted in a quality, expedited specification alongside the release of a corresponding API and SDK." 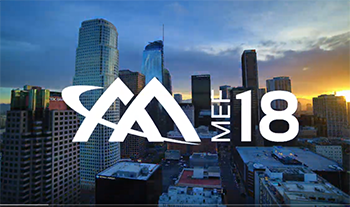 CenturyLink, Amartus, Ciena, Cisco, Coriant, Ericsson, Huawei, Infinera, Iometrix, NEC, Nokia, and RAD contributed to MEF 60. Colt and Verizon have demonstrated two-way, inter-carrier Software Defined Network (SDN) network orchestration. The demonstration, which was held at an event in London, enabled each of the companies to make near-real-time bandwidth changes in each other’s production networks. The companies described the inter-carrier SDN orchestration as a world first and an important step in enabling real-time cross-carrier automation. Both companies are working with MEF to advance the development of inter-carrier business and operational LSO (Lifecycle Service Orchestration) APIs, which will accelerate the availability of this flexibility from many more partner networks. Want to learn more about the new subscription model for MEF 3.0 certification? 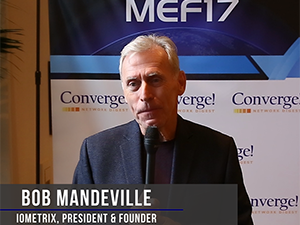 In this video, Bob Mandeville, President & Founder of Iometrix, talks about all of the changes for certification of MEF 3.0 products and services. Iometrix has developed a radically different certification test platform for MEF 3.0. The certification model undergoes profound changes and the way that companies can access certification also undergoes profound changes. Verizon is working with MEF to set standards and ensuring interoperability with customers and other carriers. Think scale and more virtualization, says Eric Cevis, President, Verizon Partner Solutions. It's all about carrier automation. MEF and ONAP recently announced a partnership to accelerate the rollout of agile, assured, and orchestrated services across automated, virtualized, and interconnected networks. Service providers, cloud providers, and enterprises are challenged to provide on-demand services profitably and competitively. This video features Pascal Menezes, CTO of MEF, and Dan Pitt, Senior VP of MEF, commenting on these developments.